The Authors: The article, entitled “Evolution of the Cerebellar Cortex: The Selective Expansion of Prefrontal-Projecting Cerebellar Lobules,” was researched and written by Dr. John Balsters, E. Cussans, Jörn Diedrichsen, Dr. Kathryn A. Phillips, Dr. Todd M. Preuss, Dr. James K. Rilling, and Dr. Narender Ramnani. All of these people have interests in the cerebellum and motor functions. Hypothesis: The authors predicted that since the prefrontal cortex has evolved to be larger in relation to the motor cortex in humans, there should also be enlargements in the cerebellum, specifically those parts that are associated with the prefrontal cortex, in relation to the lobules of the cerebellum associated with the motor cortex. 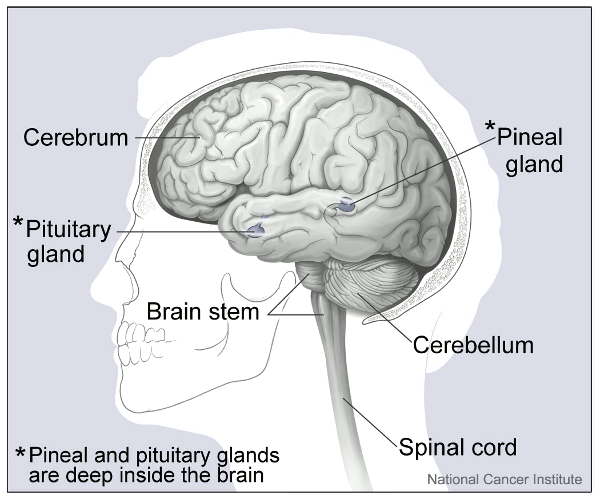 This shows where the cerebellum is located. The prefrontal cortex is located at the front of the cerebrum and the motor cortex in about the middle of the cerebrum. The Experiment: They decided to test their hypothesis by examining three different primate species, humans, chimpanzees, and capuchin monkeys. They took ten different subjects for each species, five of these were males and five were females. All of the subjects were of an age where the brain would have reached full maturity. High-resolution MRI scans were taken of each of the subject’s brains, as well as structural images. Using various programs, the scans and images were oriented in the same direction, and the cerebellum was eventually isolated from the rest of the brain, so that the scientists were left with only images of the part of the brain they were interested in (those lobules that were associated with the motor loop or the prefrontal loop). They then extracted images for the cerebellar lobules using the FSLView program. The volumes of each of the images of the cerebellar lobules were then calculated. The specific parts of the cerebellum they isolated were Lobule V, Lobule VI, Crus I, Crus II, Lobule VIIb, and Lobule VIIIa. After completing the calculations of the volumes of the lobules, they decided to compare the volumes measured against the volume of the whole cerebellum and against the sum of the volumes that had been masked, which are those related to the motor and prefrontal cortex. Results: In reference to the lobules of the cerebellum when compared to the whole cerebellum, the largest differences across the species came from the comparisons with Crus I and Crus II, in which humans were found to have the greatest proportion, followed by chimpanzees and then the capuchin monkeys. In reference to the lobules of the cerebellum when compared to the masked volumes, it was found that the volumes of the masked lobules occupied the greatest portion of the cerebellum in humans, followed by chimpanzees and then capuchin monkeys respectively. Through this comparison, it was again shown that the greatest differences between species came from the Crus I and Crus II sections. 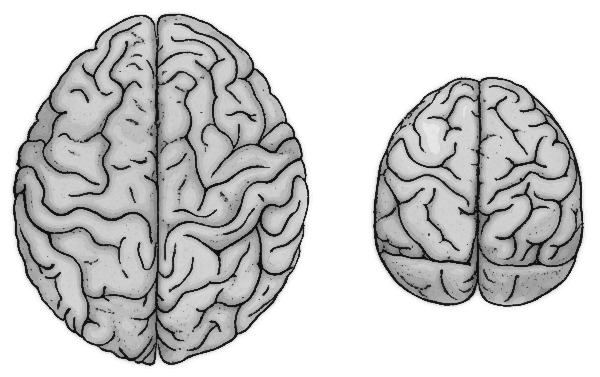 Difference in size of a human brain (left) and a chimpanzee brain (right). Discussion: They have shown that the evolution of the cortical lobules is directly related to the evolution of the neocortical areas that are associated with them. Crus I and Crus II specifically are much larger than other lobules associated with the primary motor cortex. It was also discovered that Crus I and Crus II in capuchin monkeys are significantly smaller than Crus I and Crus II in humans and chimpanzees. The enlargements in the cerebellar cortex relate to those of the prefrontal cortex in all of the species. These enlargements in the human brain correlate specifically to its functional specializations. The scientists compare their data to that of the brains of Old World monkeys and hypothesize that the volumes of Old World monkeys should fall in between those of the chimpanzees and the capuchin monkeys, which upon further examination proves to be accurate in the observation of one macaque monkey. The allometric trends that could arise due to these differences between the species are an area the scientists think needs more study and that they did not examine specifically. They do, however, state that humans definitely depart from the isometric trends, which they attribute to the differences in the cerebellum. The enlargement of the prefrontal cortex in humans had been attributed to white matter expansions as opposed to grey matter. This study suggests the opposite. It is mentioned that the cerebellum is largely made of white matter, but the lobules that were examined in this study were largely comprised of grey matter, which is the reason for the shift. My comments: I found this article to be incredibly difficult to understand, which was surprising to me because I do not usually find myself struggling to read articles about research experiments. That being said, research articles such as this are very often written with a specific audience in mind and are therefore fairly exclusionary to the general public. The problem with this is that laymen can not find materials to read on subjects like this because they are largely unreadable to the public. It can cause a lot of misunderstanding or loss of interest in subjects such as this because most people will not usually try to wrestle with and understand much of the scientific jargon used in the article.